"A tragic comedy about one woman's grief"
Three Billboards Outside Ebbing, Missouri is the third film from British/Irish filmmaker Martin McDonagh and it is one of leading awards contenders for the 2017/18 season - winning three Golden Globes and been nominated for nine BAFTAs. Mildred Hayes (Frances McDormand) is a woman whose teenage daughter was raped and murdered and the crime has gone unsolved for seven months. Angry at the police failures Mildred buys the advertising rights for three billboards near where her daughter was murdered and singles out the police chief - Willoughby (Woody Harrelson). Her controversial action divides the town. As a writer/director McDonagh's work has traversed a fine line between comedy and tragedy: his first film, In Bruges was a hilarious crime film which centered on two assassins hiding after accidentally killing a child. Three Billboards Outside Ebbing, Missouri is a more dramatic effort with some hilarious lines throughout. Due to the small town setting, McDonagh was able to pack a lot of story and character dynamics because of Mildred's actions. Mildred herself is suffering deeply from her grief due to her daughter's death, made even worst because of their bitter final exchange. The billboards are a way for Mildred to project her anger and try to make it amends to Angela (Kathryn Newton). It's Mildred's last connection to her daughter. Willoughby could easily have been made to be a villain - an uncaring cop more interested in his position and good stats - but he is a much more sympathetic figure. He is a good officer who actually wants to solve the case despite the lack of leads. He is also dealing with a terminal illness - an open secret in the town. Other major characters include Dixon (Sam Rockwell) - a dimwitted and aggressive cop who despite beating up a black suspect - Willoughby believes is a good man underneath - he just has an incredibly ugly and thick shell. He surprisingly has an effective redemptive arc which shows how skilled Rockwell and McDonagh are as an actor and a writer. The ultimate combination of their abilities comes when Dixon has a violent outburst and it was shot as one long continuous take. Mildred's son, Robbie (Lucas Hedges) also suffers from grief and depression because of his sister's death, made worst due to the billboards. McDonagh takes a number of issues into account. The majority of the town support Willoughby over Mildred because of the billboards, but the black community supports the grieving mother. It's not helped by Mildred's aggressive attitude: she states that her billboards wouldn't be so impactful if Chief Willboughby was dead. The local priest (Nick Searcy) sums it up best, the town sympathizes with Mildred's lost but not about how she is taking out her anger. Again, McDonagh shows his capability as a writer by showing these personal and social moral grays. McDormand has won awards for her performance and is one of the favorites to win the Academy Award - it been deserved because she brought out Mildred's bitterness, desperation and grief. She is loathsome and sympathetic at the same time. The cast as a whole is tremendous with the likes of Harrelson, Rockwell, Caleb Landry Jones, Peter Linkage and Clarke Peters and no one gives a bad performance, having rich material to work with. The most impressive was John Hawkes who played Mildred abusive ex-husband, Charlie: the two have a tense relationship, to put it mildly. Three Billboards outside Ebbing, Missouri also taps into a number of issues affecting America. The most obvious regards police brutality and racism. Even the setting of Missouri is deliberate because of events in Ferguson. Mildred’s move with the billboards was a desperate attempt to bring her daughter's murder back to the public's and media's attention. The small town setting means that everyone knows everyone else and allows McDonough to have the setting to explore the various character dynamics. McDonough’s great strength as a writer is his dialogue and he came up with some zingers. 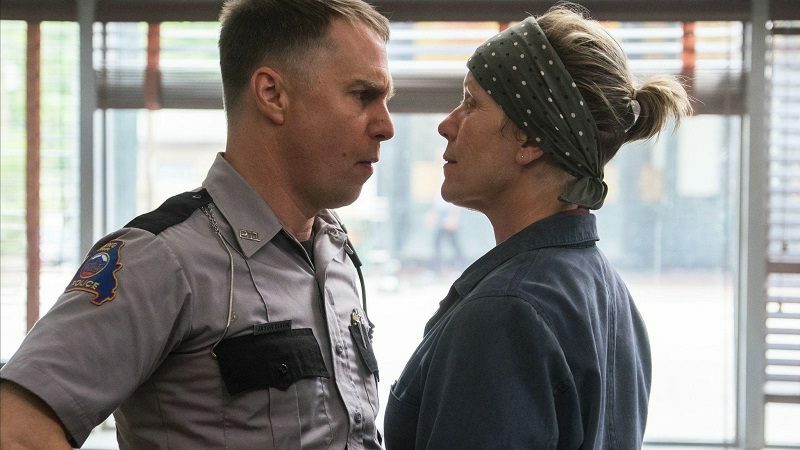 Although Three Billboards Outside Ebbing, Missouri is primarily a drama the film does have hilarious moments and McDonough has the ability to shift from comedy to drama in an instance - the best example of this was when Mildred and Dixon have an argument about the appropriate term to describe beating up black prisoners to her being questioned by Willoughby. There were some moments that didn't work like when Charlie threatens Mildred and his 19-year-old girlfriend (Samara Weaving) walks in on them - even for a scene played for laughs it was too unbelievable. 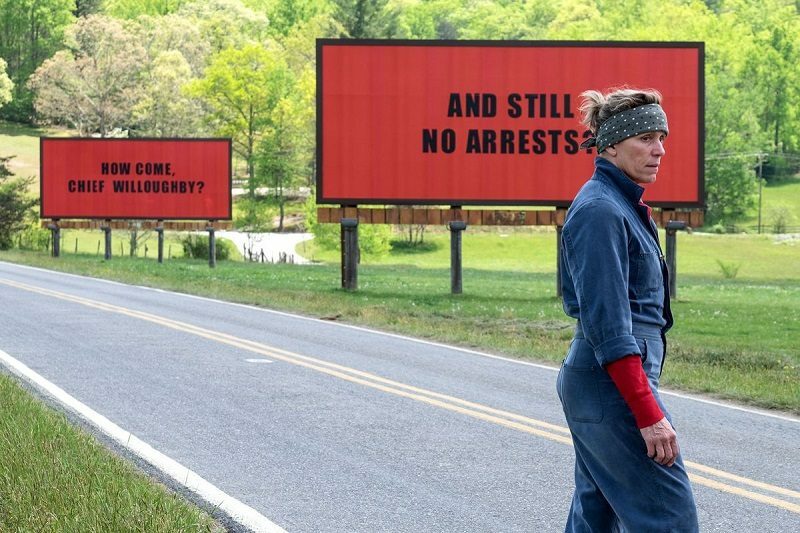 Three Billboards Outside Ebbing, Missouri is a great character piece that is comedic, dramatic and mixes it together. It was a great example of acting and screenwriting and the film is deserving most of the praise it has received.